Since 1995, Tall Oaks Enterprises, LLC has provided full-service residential landscaping services to homeowners in and around Arlington, Fairfax, Fauquier, Loudoun, Prince William, Culpeper and Rappahannock counties in Virginia. We are fully licensed and insured. 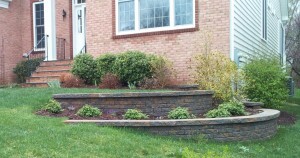 Call us today to discuss your landscaping needs and to request a quote. From our first meeting, we were impressed by Rick’s knowledge, expertise, and creativity. He listened and considered our needs carefully, explained his plan, provided suggestions, answered our questions, and offered fair pricing. We chose Rick for that job and were pleased beyond expectations. That was the beginning of a completely satisfying ongoing customer relationship. In the past year we’ve used Tall Oaks on several projects that included re-doing a small pond, building a patio and fire pit, and landscaping. We highly recommend Rick and Tall Oaks Enterprises to anyone who wants landscaping done right at a fair price. Since 2013, Tall Oaks has done all of my pruning, mulching, landscaping and has installed a beautiful walkway. Rick’s best characteristic, besides his excellent workmanship, is his reliability. Would I recommend Rick to others? Without hesitation – ABSOLUTELY!!! Rick Pfeiffer, owner of Tall Oaks Enterprises is someone I would definitely recommend to anyone in need of landscaping... He has laid a beautiful brick sidewalk from my driveway to front porch. My neighbors, friends and family were very impressed with the appearance and the brickwork. In fact, after seeing mine, some of my neighbors now have brick sidewalks and patios. Our experiences with Rick Pfeiffer and Tall Oaks Enterprises during the last six years allow for saying that we have no reservations recommending him to provide landscaping design, purchases and installation. He has provided us with designs for consideration, listened to our input, adjusted plans, and grasped our intentions for the look we sought to create. His work speaks for itself. In addition to his many noteworthy qualities of being honest, trustworthy, dependable, knowledgeable, and fair, Rick has taken a genuine interest in our personal design choices and style and has transformed our outdoor living space into a beautiful area we enjoy immensely.